You have an idea for a part. So, you grab your pencil and paper and set to work. But after hours of tediously drawing and erasing lines, you still haven’t quite got your idea down on paper. Now what? What if we told you there was a better way? A way that wasn’t so cumbersome, took less time, and provided a better end product for your company? There’s nothing wrong with a pencil and paper sketch but consider your options before diving into your next project. While traditional drafting has its benefits, it’s worth your time to consider how the power of computer software can help your project along. Here at Frontier Metal Stamping, we strive to be a metal fabrication company that our customers can trust for the latest innovations available in our industry. As such, we’re familiar with the best processes to use from start to finish of any project. So, if you’re looking for the best, come to Frontier where we speak CAD fluently. What is CAD exactly? And how will it benefit your company? Read on to learn more about this software and how it can get your project started on the right foot. CAD stands for computer aided design and refers to the use of computer software to create, change, and optimize parts or components. Through this software, designs can be analyzed, as well as created and modified. First invented in 1957 by Patrick Henratty, computer assisted design has been a huge benefit to designers ever since. It’s even available in the cloud now. And the list doesn’t end there. Implementing the design power of computers brings many benefits, and many industries are able to take advantage. How Can CAD Benefit You? Whether your type of work made it into our list or not, chances are you’ll benefit from a metal fabrication company using CAD, too. But how, exactly, can CAD benefit your business, the work you want to be done or that part you need created? Here’s what the team at Frontier Metal Stamping appreciates about this technology. Due to the accuracy of work provided by computers, CAD offers greater precision than traditional drafting. There’s much less room for error, and that isn’t accomplished through some big, complicated means. It’s simple but it’s incredibly powerful. CAD eliminates the need to produce numerous physical prototypes before moving forward with production. This allows us to save you both time and money. Thanks to its level of efficiency, CAD also reduced costs by increasing accuracy. Having a lower margin of error is never a bad thing, no matter your industry! Besides saving you money and amping up your accuracy, CAD has some pretty cool features that will aid in the design process. Designs can be viewed in 2D or 3D, seen up close or from a distance, and changed in shape or scale. It’s incredibly versatile. CAD allows us to show you the design from any angle you want. You can also watch your part in action through a simulation! CAD gives us total freedom to work with your design, all without the hassle of working with (and wasting) real materials for test runs that show what’s working and what needs to be adjusted or changed. Remember, one of the greatest benefits of using CAD is this: it saves you time. Which essentially means you’re saving money, too. There are many benefits to using CAD, but traditional drafting is great too. So why should you specifically use a metal fabrication company that specializes in using CAD for their customers? There are several reasons. For one thing, CAD increases productivity. Through the use of automation, your metal fabrication company can produce more and finish a design quicker than fully by hand. It also improves quality. Many workers are highly precise, but there’s always room for error when a task isn’t performed exactly the same way every single time. We reduce the margin of error by letting a computer assist in part creation. Typically, we’ll also have far less wasted material. Utilizing the power of CAD enables us to use materials as efficiently as possible and create less waste. Total creativity will be yours. There are fewer limitations in the virtual world, and we can explore all of your out of the box ideas, no wasting materials. Simply put, your company and the goals you wish to achieve will benefit from a partner that uses CAD in many ways. Punching and cutting accurately may be difficult to do by hand, and hand-made designs can be hard to follow. Both of these problems are solved by using computer technology. And shapes that were tricky to get accurate, such as circles, arcs, or ellipses, will be accurate with much less effort. Thanks to this software, your project will benefit from the best of all worlds. From a precise, computer-generated initial design to consistent and efficient manufacturing overseen by the skilled craftsmen here at Frontier Metal Stamping. So, if you have a sketch, get in touch and request your Design for Fabrication review. We’ll look at fit, form and function and advise you every step of the way. 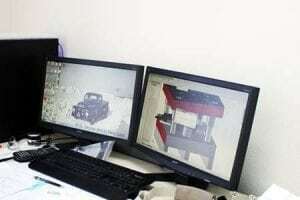 No matter how you look at it, there are aspects of computer aided design that will undoubtedly benefit you by choosing the right metal fabrication company. And you don’t have to wait to see the benefits. Whether you want to save money and time or be more precise and creative, maybe a bit of both, Frontier Metal Stamping is here to take on your next project. Based in Denver and serving all of America, we specialize in CAD and quality results. We even offer free, convenient quotes right from our website. Get in touch today.